The NCAA’s new transfer waiver rule lets players make the case that they should be allowed to play right away at their new schools, so long as their transfer was triggered by hardships beyond their control. Holding aside, for the moment, that requiring a waiver in the first place is bogus and unfair, probably nobody in the NCAA anticipated this process would open precisely the can of worms that has now been opened for Texas A&M, where the hardships being described by an outgoing transfer include a whole damn catalogue of violations. Linebacker Santino Marchiol left Texas A&M this summer, after redshirting as a freshman last season while recovering from ankle surgery. Marchiol has since enrolled at Arizona and is practicing with their football team, under Kevin Sumlin, who originally recruited him to A&M but was fired last November. Marchiol would like to play right away at Arizona, without sitting out a year as a transfer, something NCAA rules only make possible if Marchiol can show his transfer from A&M is due to “documented mitigating circumstances that are outside student-athlete’s control and directly impact the health, safety and well-being of the student-athlete.” Marchiol’s case here is both reasonable and righteous: he says Fisher’s program is exploitative and corrupt, and is not what players recruited by Sumlin signed up for. If demonstrating that case means shedding light on violations, responsibility for that shouldn’t fall on a player with a full year of eligibility at stake. What Marchiol describes in this USA Today report includes optional offseason summer workouts being turned into mandatory practices; pre-dawn “academic” sessions being used for film study; clandestine cash transfers between coaches and players, for recruiting purposes; and, of course, the same kind of toxic and insane disregard for player health that was recently exposed in the football program at Maryland. “We’d be in our defense running our plays and if the offense caught a ball you’d see Elko go running over and go, ‘What the f—-? You’re supposed to (cover) here over the top,’” Marchiol said, describing a voluntary workout. Marchiol spent that practice running 24 100-yard sprints, “until he could not feel his ankle anymore.” A week later, he left the program altogether. 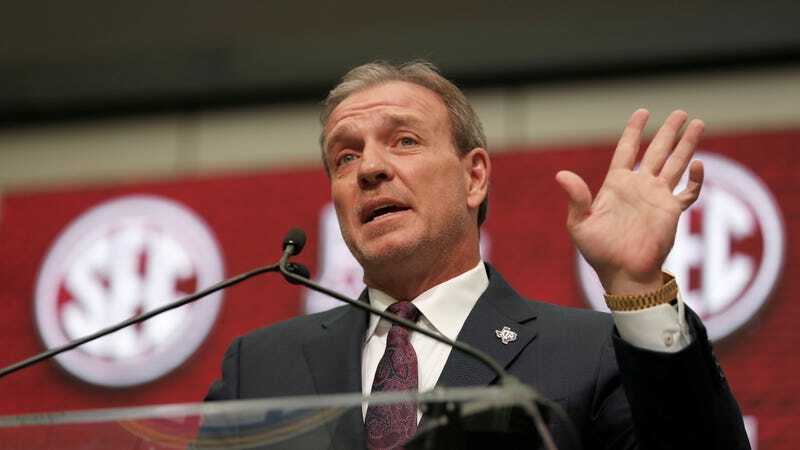 Marchiol reportedly did not contact the NCAA directly with his observations, but detailed them in a letter to Arizona’s compliance office, as part of his effort to receive a transfer waiver and play this upcoming season for Sumlin at Arizona. Texas A&M told USA Today that they “are reviewing the situation with the NCAA and the SEC Office.” You should read the whole report, it’s really something.